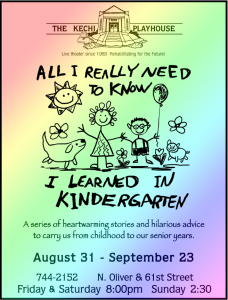 Based on Robert Fulghum’s best-selling books, Kindergarten takes a funny, insightful, heartwarming look at what is profound in everyday life. This tightly woven adaptation has earned standing ovations from Singapore to Prague— from L.A. to D.C. It’s an evening of theatrical storytelling in revue format, with monologues, dialogues, and multiple voice narration, enhanced through the use of piano underscoring, which provides fluidity, charm, and emotional texture, and seven optional original songs. The delightful stories feature colorful characters such as: a shy little boy who insists on playing the “pig” in his class production of Cinderella and steals the show; a man whose dream of flying carries him high over Los Angeles … in a lawn chair buoyed by surplus weather balloons; a “mother of the bride” who’s staged a perfect wedding—until the bowling ball of fate rolls down the aisle; and a modern-day Greek philosopher who finds the meaning of life in a piece of broken mirror from World War II. These stories celebrate our very existence, from the whimsy of childhood to the wisdom of old age. 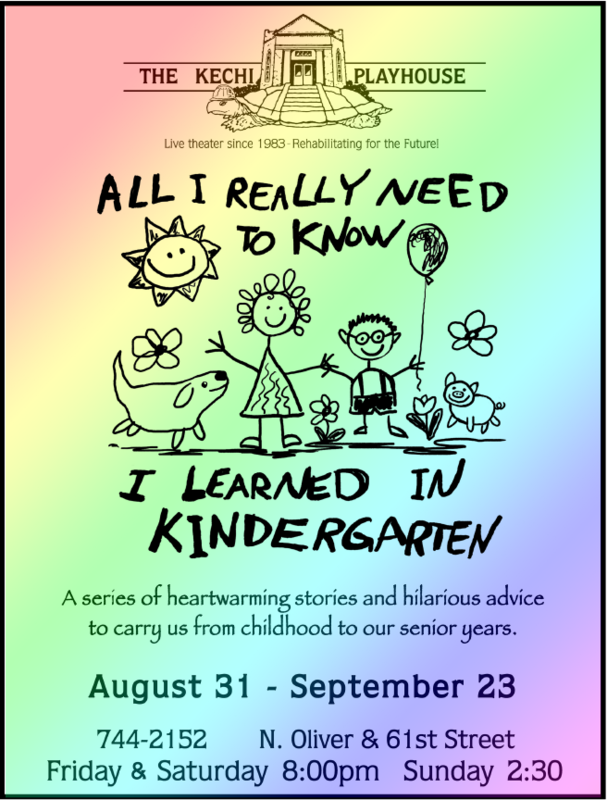 Tickets are $14.00 on Fridays and Saturdays and $12.00 on Sundays. We accept cash and checks only. We cannot accept credit cards. Show times are 8:00 pm on Fridays and Saturdays. We have Sunday matinees at 2:30 pm. The house generally opens 30 minutes prior to curtain. Call 316-744-2152 for reservations and more information.